Weather concerns have pushed back an Austrian daredevil's attempt to break the world record for highest-ever skydive by one day, to Tuesday (Oct. 9). Felix Baumgartner was slated to leap from a balloon nearly 23 miles (37 kilometers) above southeastern New Mexico on Monday (Oct. 8), breaking the sound barrier as he plummeted to Earth in a harrowing freefall. But an incoming cold front is expected to bring cooler temperatures, strong winds and a bit of rain to the launch site on Monday, said officials with Baumgartner's mission, which is known as Red Bull Stratos. The team expects conditions to clear up considerably by Tuesday. If so, around dawn on that day a huge helium-filled balloon will lift off from Roswell, N.M., carrying Baumgartner and his custom-built 2,900-pound (1,315 kilograms) capsule to an altitude of 120,000 feet (36,576 meters). The 43-year-old daredevil will then step into the void, shattering a skydiving record that has stood for more than 50 years. The current mark of 102,800 feet (31,333 m) was set in 1960 by Air Force Capt. Joe Kittinger, who now serves as a Red Bull Stratos adviser. If all goes according to plan, Baumgartner will also become the first skydiver ever to break the sound barrier. And he should also set records for the longest-duration freefall and highest manned balloon flight, Red Bull Stratos mission officials say. Baumgartner's leap requires calm conditions, because his 55-story-tall balloon is fragile — the material is 10 times thinner than a plastic sandwich bag — and could be damaged by high winds. The daredevil's team has said they won't lift off if winds at the launch site exceed 2 mph (3.2 kph). 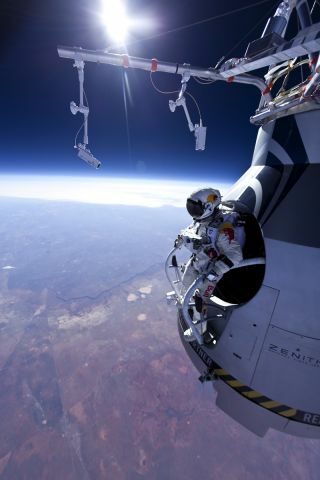 Red Bull Stratos officials have described Baumgartner's record-breaking attempt as a jump from the edge of space. However, space is generally considered to begin at an altitude of 62 miles (100 km), or 327,000 feet.